The Palram 6 ft. x 10 ft. SkyLight Shed is ideal for storing, organizing and protecting your outdoor life. Palram SkyLight sheds were developed and built to last; they do not fracture, bend or discolour, and withstand extreme weather conditions such as hail and high temperatures. Made with Palram's virtually unbreakable Polycarbonate and reinforced aluminum frame, the SkyLight Shed will provide years of maintenance-free protection. At first you may wonder about the flexibility and thinness of the Polycarbonate panels, but rest assured that once assembled, the shed will be rigid and durable. The unique SkyLight Polycarbonate roof panels transmit natural sunlight throughout the day while having an opaque external visibility for maximum privacy. Front and back vents are included for ample airflow. Designed with your outdoor needs in mind, the SkyLight Shed will compliment your home and enhance your outdoor living space. The 10 feet x 20 feet Utility Shed offer tremendous value and space. The extra large swing-open door opening easily handles storage of large tools and equipment. Makes a great work shop or hobby area! An interior peak height of over 7 feet 7 inches provides added headroom and a large area for organized tool storage. 6 ft. x 10 ft. SkyLight Storage Shed in Grey The Palram 6 ft. x 10 ft. SkyLight Shed is ideal for storing, organizing and protecting your outdoor life. Palram SkyLight sheds were developed and built to last; they do not fracture, bend or discolour, and withstand extreme weather conditions such as hail and high temperatures. Made with Palram's virtually unbreakable Polycarbonate and reinforced aluminum frame, the SkyLight Shed will provide years of maintenance-free protection. At first you may wonder about the flexibility and thinness of the Polycarbonate panels, but rest assured that once assembled, the shed will be rigid and durable. The unique SkyLight Polycarbonate roof panels transmit natural sunlight throughout the day while having an opaque external visibility for maximum privacy. Front and back vents are included for ample airflow. Designed with your outdoor needs in mind, the SkyLight Shed will compliment your home and enhance your outdoor living space. 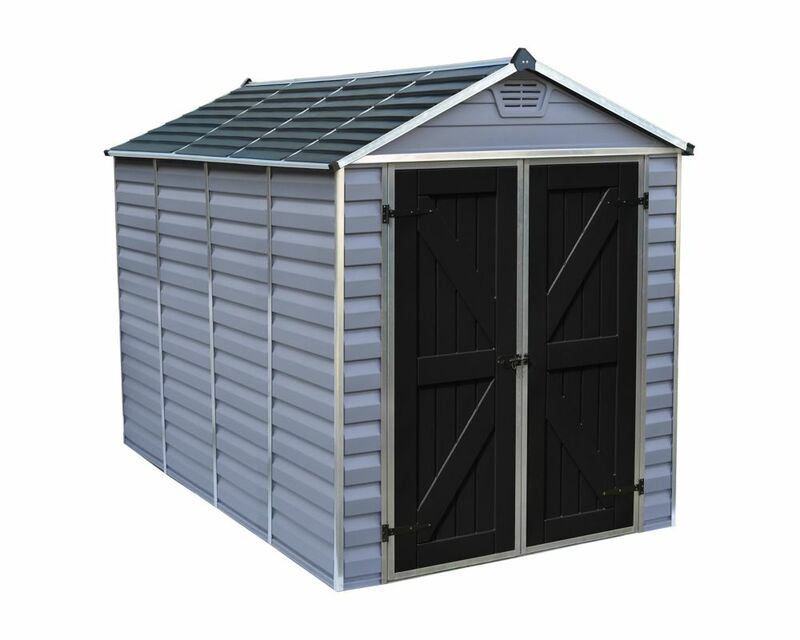 6 ft. x 10 ft. SkyLight Storage Shed in Grey is rated 2.8 out of 5 by 6. Rated 2 out of 5 by Disappointed from Not a good product for your dollar Bought this shed via online. This is the most cheaply made unit I have seen. There is little to no security for your items inside. The doors are very thin, with little support for the hinges. Assembly requires approx 24” on either side to allow for the insertion of roof panels. The floor is very thin and flimsy. The overlap on the floor panels do not lay flat, due to the lack of ridgidity. Rated 1 out of 5 by Alex397 from Stay away !! Cheap, paper thin, this thing it’s so fragile that it’ll pierce if you drop a nail on it. Rated 4 out of 5 by Graham from Easy to assemble Very easy to assemble. Wouldn't put in an open area, but with some shelter it does the job! Rated 3 out of 5 by Steve from It's not what it looks like online Very disappointed how flimsy it is. After assembly it still moves side to side. Maybe if mounted on concrete slab would work better. I'm worried the wind might blow it away. Rated 3 out of 5 by Gary56 from attractive when complete I tried to put this shed up my-self. wish the instructions came written as well. not just pictures. It was windy the day I started and things kept blowing around. The shed is more solid when complete but the doors still seem flimsy and the bottom latch for the door keeps bending. I do like the natural light the roof allows and seems like lots of space. You can't really put hangers up for tools,etc. so I ended up putting some free stand shelves inside. Hopefully the resin construction will last a long time. I 'll see this winter how much snow gets inside from the openings along the roof and the vents. Hi Jake, The SkyLight 6 x 10 door's height is 171 cm and its width is 127.5 cm. Thanks and have a wonderful day!